Charlie is a sweet baby boy who is already becoming an Instagram star—with a little help from his talented parents. Is this the cutest way to record a first year? Meet Charlie Moldavon, the 41-week-old baby who has already amassed over 1,500 followers on Instagram and has some seriously lofty dreams. Fans follow along @CharlieDreamsBig, the Instagram account that feature photos of Charlie covered in illustrations done by his doting parents. The photos reflect all sorts of amazing futures playing out for the little one. In one pic, he's a firefighter, in another he's posing on a balance beam. In these illustrations, Charlie also gets to be a drummer, an athlete and a presidential candidate. And it's all completely adorable. 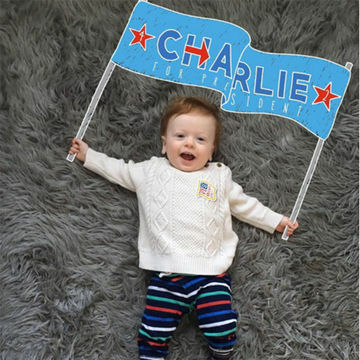 We love this—not just because of how visually adorable it is, but also because the message Charlie's parents put forth, that their child can do or be anything he wants, is so incredibly special. Charlie's parents, Amanda and Dave, decided to start the account on a whim, according to PopSugar. Dave used Adobe Illustrator to put together enhanced photos as a creative way to document his son's growth and the result was so adorable, it soon caught the public's attention. The couple has had so much fun doing this, they've even played around with the idea of building an app so other parents can do something similar. They also plan to compile a book of these images—what a sweet idea, right?